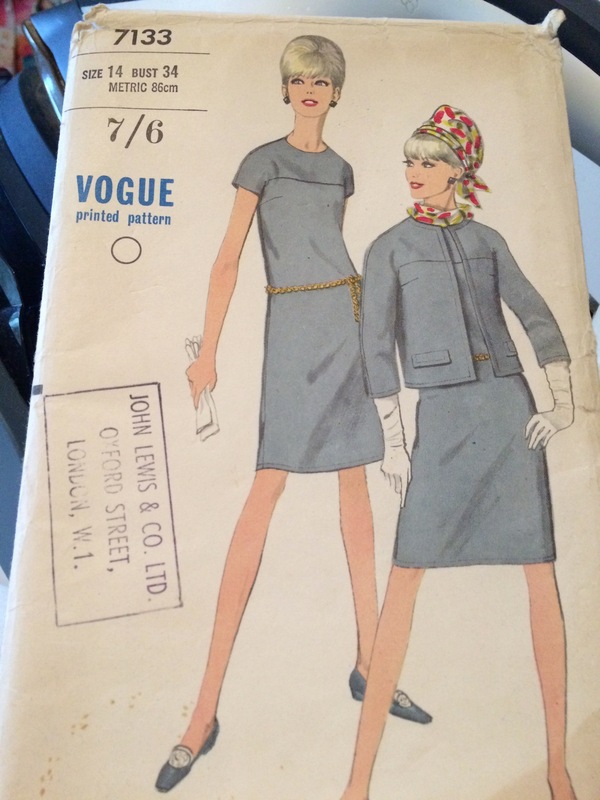 In a previous post I used this dress pattern as an example of what it makes sense to do before you start to actually make a garment. Having written the post I thought I might as well make the dress. I love it. The colour, 1967 style and fit are just great. I love it because it is rather loose, but it is also smart and tailored. Unfortunately I don’t think I will ever wear it. I followed the instructions to the letter and underlined the dress. The crispness of the silk organza undoubtedly helped the linen to take the required form. I have underlined with organza before but have usually added a lining too. This time, as an experiment, I did not. I knew that many couture and designer dresses are made with underlining only and thought I would give it a go. I did depart from the pattern in one respect in that it proposed that the seams were oversewn by hand. Instead I finished all the seams either with a zig zag stitch, or with the overlocker. A mistake, I think. I like a lining in a dress. It feels so soft and luxurious. It slips on. It sparks joy in me. 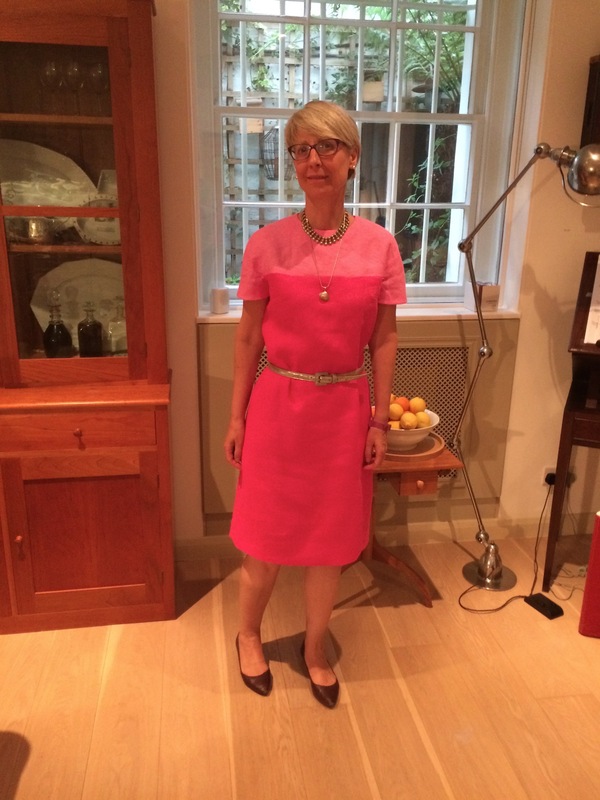 It is practical too – if a dress is lined I don’t usually finish the seams at all. They do unravel a little bit, but the lining prevents most of the wear and tear. This dress has the underlining and finished seams and I just can’t stand wearing it. I did get a bit sunburnt at the cricket this week, which has made my upper chest a little sensitive. But the organza feels scratchy and uncomfortable. However the style of this dress is right up my street. I love the fact that it is supposed to be shift-like and loose. I made a size 32 bust (I am 34) and it still feels very comfortable. Have you ever noticed that a garment made with sufficient ease always makes you look a little smaller and slimmer than a garment that is too tight? I think I may well make up this dress again in another colour, but with a lining, or without underlining. Have you ever had a scratchy dress? It looks lovely! The colors are great and the style suits you. Generally organza softens with washing. Can you wash the dress? The linen will also soften and you may not want that. It’s lovely. If you added a lining as well would it be too heavy? Scritchy scratchy organza- yep, been there. I had to add a tulle underlayer to the bodice of my daughter’s wedding dress to deal with the scritch factor. I’d just add a habotai lining- nice and light, and wouldn’t add bulk.It’s a good style on you, but I think a couple of vertical darts would streamline it just a tad more, for even more elegance. The effect of the colours is hidden by the lighting in the photo though, I remember the pinks as being more vibrant? Well as you were the one who proposed using more silk organza and suggested a cheap supplier, I should have come back to you for more advice. I will have to decide weather to line or whine. Can you take it apart enough to add a lining? As you love it, it seems a shame that you can’t wear it because of the scratchy underlining. I’m with others who suggested adding a lining. If you didn’t prewash both the linen and organza they may shrink and not necessarily the same amount. Washed organza is softer and I sometimes do that if I want a less crisp look. This looks lovely on you and it would be a shame not to wear it. The last photo is too cute! Definitely – add a lining. Just attach it with hand sewn fell stitching – it should work like a charm. The dress is too attractive not to wear! I made a dress for a friend with a silk organza lining, installed as you described. She said it felt like a hair shirt and didn’t believe me when I said it was silk. It does feel exactly like a hair shirt. I have it on today with a slip, and it is just bearable. sad that it won’t be worn……..so pretty……..color fabulous! Can you add a lining, a simple scoop neck slip, attached only at the shoulder seams? Wonderful nudist baby…..having had a couple of those myself (and the attendant puddles of pee in shoes, on occasion) it makes me feel quite sentimental. This dress is beautiful on you and I think it is a shame that you can’t wear it with the scratchy organza next to your skin. Like most of the other posters I think adding a light weight silk lining would make it work. I know how frustrating it is to finish a project and find it unwearable and how unmotivated I feel to do any more work on it at that point. However, I think that going back in and adding a lining and, as Demented Fairy suggests, some vertical darts for waist shaping, would make this dress a wonderful addition to your wardrobe. I have made several dresses with organza underlining and they always need a lining because the cut edges of organza feel horrible against the skin. I don’t think it is a problem that you finished the edges as far as adding a lining goes. What a beautiful and well made dress!! I hope you do wear it because it looks great! I have no experience with sewing with silk but really must give it a go! Any tips on working with silks? Yes – just do it! Silk is not that difficult – definitely much easier than polyester (artificial) silk. What are you troubled by – the cutting out or the sewing up? Wonderful style that suits you to a T. Pity that you will not probably wear it but I know how that is – I made a beautiful ball dress a few years back just to try out the style and use some stash fabric (like a magpie I am attracted to bright sparkly pretties that are so not my lifestyle). It hangs in solitary splenda in the sewing room. As for prickly fabric I have an awesome embroidered silk 1/2 made into a jacket that has never been finished as it prickles, to line it would have spoiled the translucent quallity. I would be interested in knowing how long it would take to a) make a new dress and b) remake the lining to fit the original. I think starting from scratch (if you pardon the pun) is often quicker but there’s an element of waste that would niggle at my conscience! It must have been years and years ago, but I remember using invisible thread to sew something and wherever my skin was in contact with the seam, it was very scratchy. Yes I remember that feeling too. Also labels sewn in with invisible thread so the thread did not need changing. Two reasons to rip out those labels. Lovely colour, K. Hope you find a way to make it wearable. OK Lyn. I will make another one as you suggest and see what we think! I can see no reason why you cannot drop in a lining, allowing for the neck facing when drafting the lining. Just slip stitch it in at the neck, around the sleeve hem, slip stitch around the zipper opening, and do some version of a hem stay. There is no reason to let a good dress go unworn. I would not wear it with the organza next to my skin either. Sorry it didn’t turn out, it is a lovely colour though!